Marshall wideout Tyre Brady (8) breaks away from a pair of Texas San Antonio defenders during a Nov. 17 football contest at Joan C. Edwards Stadium in Huntington, W.Va.
Marshall linebacker Omari Cobb (31) chases down a UTSA ball carrier during a Nov. 17 football contest at Joan C. Edwards Stadium in Huntington, W.Va.
MIAMI, Fla. — Making the most of enough opportunities. 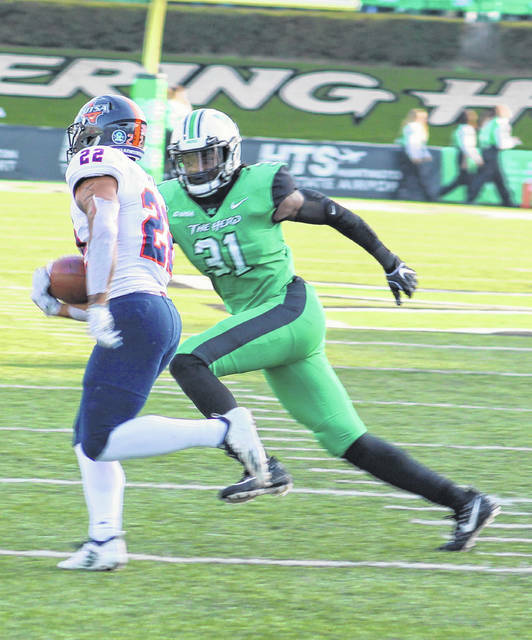 Marshall came away with a defensive touchdown and added another score through special teams while leading wire-to-wire on Saturday during a 28-25 victory over host Florida International in a Conference USA football matchup at Riccardo Silva Stadium in the Sunshine State. The visiting Thundering Herd (8-3, 6-2 CUSA East) played the spoiler role perfectly after storming out to a quick 14-point advantage late in the first quarter, but the Panthers (8-4, 6-2) — who were trying to clinch the East Division title — rallied with consecutive scores that cut the deficit down to 14-10 entering the break. Brandon Drayton extended Marshall’s lead back out to double digits late in the third after falling on a blocked punt in the end zone, allowing the Green and White to secure a 21-10 cushion headed into the finale. FIU countered with a 9-play, 71-yard drive that ended with an 8-yard touchdown run by Christian Alexander, trimming the deficit down to 21-18 with 12:45 left in regulation. MU, however, put together a 9-play, 59-yard drive that resulted in Tyre Brady’s second touchdown catch of the day — this one from Isaiah Green for three yards for a 28-18 edge with 8:42 remaining. Florida International answered right back with a 9-play, 75-yard drive the ended with a Napoleon Maxwell 1-yard run that cut the lead down to three points with 4:47 left in regulation. What ensued was arguably Marshall’s finest offensive possession of the day after the Panthers elected to kick the ball deep and trust their defense. 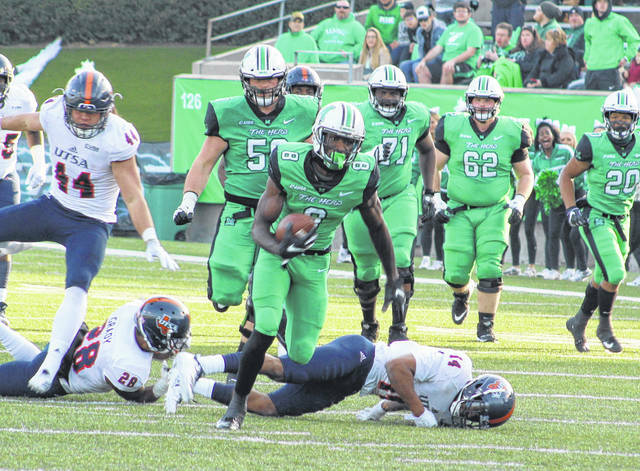 The Herd started at their own 23 and strung together a 10-play, 65-yard drive that led to absolutely nothing on the scoreboard, both points-wise or time-wise. MU faced only one third-down conversion situation and picked up four first downs on the ground, then took a pair of kneel downs in the final 1:02 to wrap up its third consecutive victory. The Panthers’ loss opened the door for Middle Tennessee State to win the East Division outright as the Blue Raiders posted a 27-3 victory over visiting Alabama-Birmingham in both teams regular season finales. Both MTSU (8-4, 7-1 East) and UAB (9-3, 7-1 West) meet again in Murfreesboro (TN) on Saturday in the Conference USA Championship game at 12:30 p.m. Both Marshall and FIU finished the day with two turnovers apiece, but the Herd came away with the only points off of takeaways as Omari Cobb had a 25-yard interception return for a touchdown at the 4:41 mark of the first. Cobb’s score doubled Marshall’s lead and followed a 16-yard touchdown pass from Green to Brady at the 8:54 mark for the game’s initial points. Jose Borregales came up with Florida International’s first points following a 22-yard field with 1:32 left in the opening period, then Anthony Jones scored on a 1-yard run for a 14-10 contest with 11:25 remaining in the first half. Borregales missed a 28-yard field goal wide left with under a minute left in the first half and also had a 43-yarder blocked by Juwon Young at the beginning of the third quarter. The blocked kick followed a Herd interception on the opening play of the second half. Marshall’s Justin Rohrwasser also missed a 25-yarder wide left early in the second canto. Both teams punted the ball three times apiece. The Panthers claimed a 25-21 edge in first downs and outgained the Herd by a 391-330 margin in total yards of offense, including a 190-154 advantage on the ground. FIU had possession of the ball for 32:29 of the 60-minute affair and was also 4-of-5 on scoring chances inside the red zone. The Herd, conversely, went just 2-of-5 inside the 20-yard line. Brenden Knox paced the MU ground attack with 109 yards on 19 carries, followed by Anthony Anderson with 36 yards on seven rushes. Green completed 18-of-27 passes for 176 yards, tossing two touchdowns to go with a pair of interceptions. Brady led the guests with five grabs for 45 yards and two scores. Frankie Hernandez paced the MU defense with eight tackles, while Nazeeh Johnson and Chase Hancock were next with six stops apiece. Along with his pick-six, Cobb also recorded the only sack of the game. Donyae Moody also picked off a pass midway through the third quarter. Maxwell led the FIU ground attack with 96 yards and a score on nine carries. James Morgan completed 21-of-33 passes for 177 yards while throwing two TDs and a pair of picks. C.J. Worton and Maurice Alexander led the Panthers with five catches apiece for 62 and 28 yards, respectively. Jamal Gates paced the Florida International defense with 10 tackles and Sage Lewis added nine stops. Richard Dames came away with both FIU interceptions in the third quarter. Marshall snapped a two-game skid against the Panthers and are now 6-0 this year when leading after the first quarter. The Herd also won their 17th consecutive game in which they scored first. After having a Week 3 game at South Carolina postponed during Hurricane Florence, the Herd will complete their regular season schedule on Saturday during an impromptu contest at Virginia Tech. Kickoff at Lane Stadium in Blacksburg is slated for noon.